It is, as Eamonn Fitzmaurice reminded us afterwards, only the first weekend in February, so some perspective is called for. Nonetheless, as a coming-of-age experience, this Casltebar clash could prove a defining moment for this new-look Kerry team. Down to 13 men with 21 minutes remaining against the beaten All-Ireland finalists - who by then had 10 first-choice players, including All-Stars David Clarke, Colm Boyle, Aidan O'Shea and Andy Moran, on the field - Kerry actually outscored them from play from there to the final whistle. In an often chaotic contest where the referee's benign approach to issuing sanctions appeared to encourage players to transgress, Kerry had lost two-thirds of their half-back line by the 54th minute. Ronan Shanahan - who Fitzmaurice was frantically trying to replace at the time after he was fortunate not to have to picked up a second booking moments earlier - transgressed for the third time in 10 minutes. This time there was no escaping a second yellow. Three mintues later and for the second match in-a-row centre-back Gavin Crowley - who picked up his first yellow after an off-the-ball wrestling match with Aidan O'Shea in the first half - saw red. Kerry reacted by pulling 12 players behind the ball as they sought to protect their five-point (1-14 to 2-6) advantage. 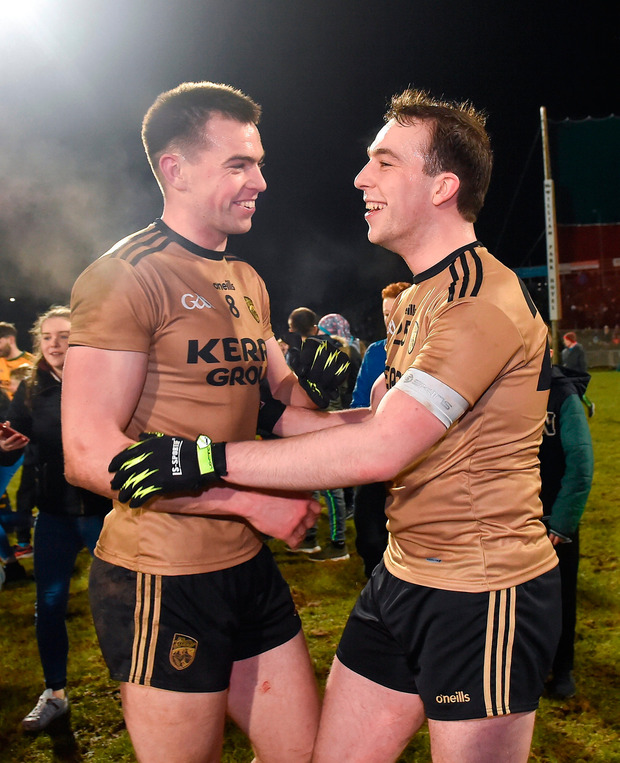 Paul Murphy and Paul Geaney - who kicked the only point from play during the remainder of the contest - showed terrrific leadership as the visitors comfortably held out to record only their fourth league win in 10 attempts over Mayo in this decade. "When our backs were to the wall when we were down to 13 men the lads showed a lot of courage," Fitzmaurice said. "We played a kind of game we wouldn't be to used to playing. "It was just about a bit of courage and even though indiscipline had got us into a bit of bother we showed good discipline in the last 10 minutes in particular to see it out." 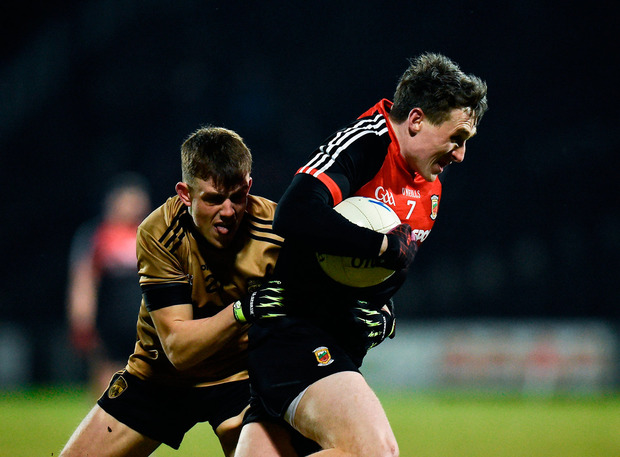 Mayo contributed significantly to their own downfall. Despite being outplayed for long spells, they had twice worked themselves back into the contest though goals in the 13th and 35th minutes from Diarmuid O'Connor - the latter from a penalty after Neil Douglas was fouled. But their efforts to overhaul Kerry at the business end of the contest were fatally undermined by an uncharacteristic bout of inaccurate free-taking. 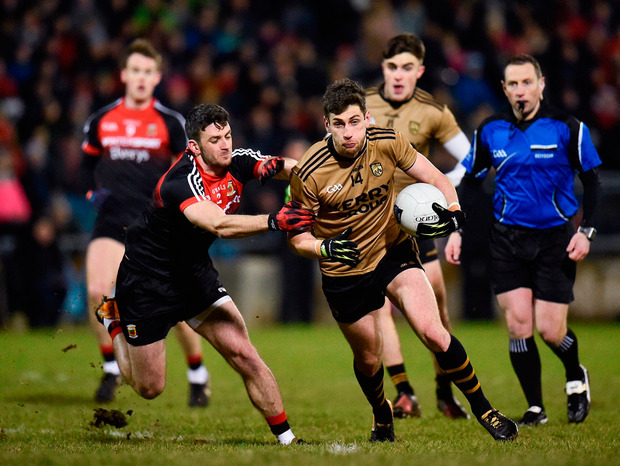 Substitute Cillian O'Connor - who had taken over the free-taking duties from Jason Doherty immediately after his 46th-minute introduction - missed three placed balls, two frees and a 45, while Doherty missed one. Mayo might still have salvaged the game had Kerry corner-back Shane Enright not emerged from the gloom to pull off a breathtaking goal-line save from an Eoin O'Donoghue piledriver 11 minutes from the end. 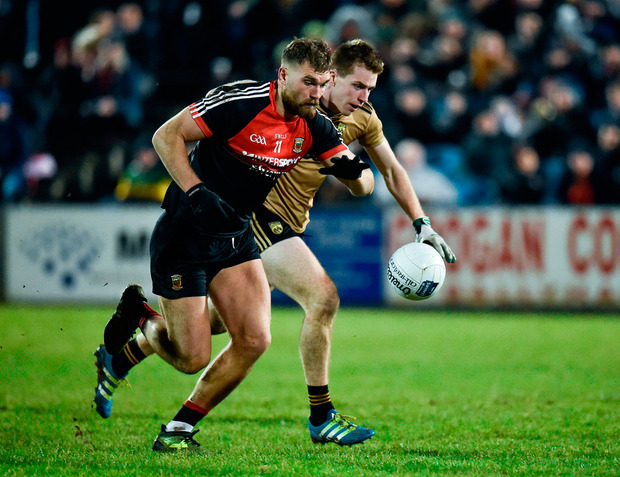 "We had three relatively scorable frees in that period which we didn't take and we had a goal chance cleared off the line," Mayo boss Stephen Rochford said. "But that's the main thing about this time of the year: if you don't show a ruthless enough streak you are going to pay the ultimate price." Ultimately, it was the poverty of their forward play which condemned Mayo to another home defeat before an attendance of 11,639. Last season they also lost two league games at Elverys MacHale Park and were it not for their form on the road they would have been relegated. It could be more of the same this spring. Diarmuid O'Connor was the only one of the nine forwards they used to score from play and they only managed two points from play during 75 minutes of action. By contrast, all but one of Kerry's 16 scores came from play with five of their forwards getting on the scoresheet. Disappointingly, last year's minor star David Clifford, who was denied a goal in the opening minute by the All-Star goalkeeper, had to be replaced after 17 minutes after he tweaked his hamstring. His withdrawal underlined the demands being placed on third-level players at the moment. 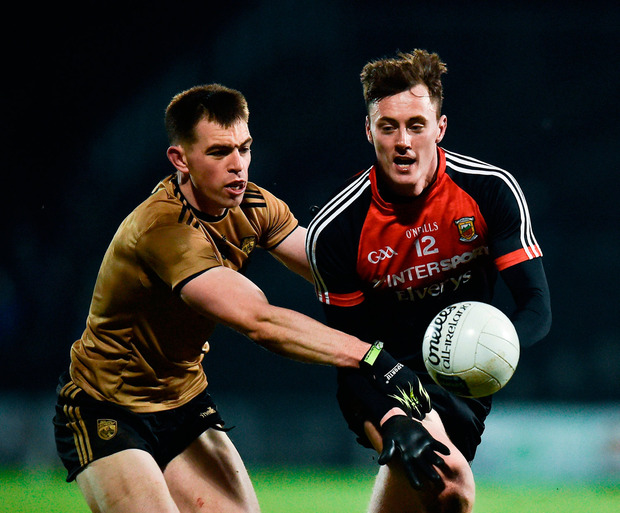 By next Sunday evening 13 of the players who started in Castlebar could have played five games in two weeks due to their commitments in the Allianz League and the Sigerson Cup. "Look, the scheduling isn't ideal," said Fitzmaurice. Twelve of his squad will be on Sigerson duty this week. "The lads are monitored very closely by us in terms of their load they are doing with us and what they are doing when they are away with their colleges. "We are are just going to have to be very careful with them from now on to avoid injuries. The players' welfare is always number one in our thinking so we have to look after the lads." So after failing to beat Mayo on three occcasions in 2017, Kerry did it at the first attempt in the new season. It is the first time since 2009 that they have opened their league campaign with back-to-back wins. But long after the two league points are forgotten about this victory will resonate with this bunch of players, as Fitzmaurice acknowledged. "The big thing was for the younger players to be exposed to that kind of battle against a seasoned, experienced team. Division 1 football at its best, the learning and that for them is incalculable really." Their defence still looks vulnerable when run at but the resolute spirit they displayed when faced with a crisis was admirable. One thing is for sure, though, regardless of the competition or the time of year when these two teams collide there is no shortage of rancour, drama or controversy. scorers -Kerry: P Geaney, BJ Keane, S O'Shea (1 45) 0-3 each; G Crowley 1-0; M Burns 0-2; B O'Sullivan, D Clifford, B O'Sullivan and P Murphy 0-1 each. Mayo: D O'Connor 2-1 (1-0 pen), J Doherty 0-3 (3f), C O'Connor 0-2 (2f), B Moran, E Regan (f) and A Moran (f) 0-1 each. Kerry - S Murphy 7; B Ó Beaglaoich 7, J Foley 7, S Enright 7; P Murphy 8, G Crowley 6, R Shanahan 5; J Barry 7, B O'Sullivan 7; M Burns 7, S O'Shea 8, S O'Brien 7; D Clifford 6, P Geaney 8, BJ Keane 7. Subs: J Savage 7 for Clifford (17), B O'Sullivan 7 for O'Brien (44), A Barry 6 for Keane (53), M Flaherty 6 for O'Shea (55), E O'Conchuir 6 for Burns (59), C Coffey for Ó Beaglaoich (BC, 66).